You’ve probably heard about the five fitness trends gaining traction in 2017. Many of them share a theme: decreased reliance on traditional gyms. There’s nothing wrong with heading to the gym to get your fit on. However, many people are looking for a new place to work out and finding it at home. Having your “gym” in your living room is convenient for a few reasons. For one, you never need to worry about crowded spaces. Transportation is a cinch, and the commute can be measured in seconds and footsteps. Working out at home can also be cheaper. Depending on where you live, a monthly membership to a gym will typically run you anywhere from $40 to upwards $75 (and some cost over $100!). That’s not counting the sign-up fee. Join a gym, and you’re looking at spending $1,000, easily, in the first year. Freestanding bags, and heavy bags with a stand, are perfect for home gyms because they don’t need to be mounted on a ceiling or wall, and can be placed anywhere. Freestanding bags have the added benefit of being easy to move and store when not in use. If you’re new to using a bag, check out this guide to striking techniques for beginners! Bag work is great not just for cardio training, but for muscle conditioning as well. Bags that are used for basic striking and cardio, like the Cardio Wavemaster, Wavemaster 2XL Pro, and original Wavemaster, cost less than those used for high-level martial arts or self-defense training, like the Versys VS. BOB. If you will be using your bag for a dual purpose, like fitness and martial arts, it’s worth looking into a bag like the Versys. But if you plan on a fitness focus, a bag from the Wavemaster line might be a better option. If you have a bag you plan on punching, you’ll need gloves, and possibly hand wraps (wraps are used to provide additional support to the hand and knuckles). Open palm gloves as well as closed-thumb gloves will work for bag training. If you’re a woman, you may want to get women’s fit gloves. You should wear whichever gloves feel comfortable, but consider choosing bag gloves rather than sparring/boxing gloves. Sparring gloves are wonderful for their intended purpose, but you may find them to be a bit bulky for bag work. If you want to add an additional strength-building and weight training element to your bag work, weighted gloves are the way to go! Make sure not to go too heavy right away, though – you can put too much strain on your wrists punching with weighted gloves if you haven’t already built up muscle. Core, abs, arms – you can work them all with the Power Grip Ball! This piece of equipment embodies everything that’s great about at-home fitness: easy to use, multi-purpose, convenient storage, and inexpensive. Century’s Power Grip Balls are upgrades of the traditional medicine ball. They have textured rubber grip panels that help keep your grip on the ball secure (helpful during sweaty workouts so you don’t – literally – drop the ball)! No, there’s not a gold-handled rope with braided ostrich leather cord. The reason the price discrepancies are so great is the Challenge Jump Rope. This thick, heavy rope is worth every pound if you’re serious about burning fat. It’s made from the same material as the dual heavy ropes you’ve seen in gyms. There’s also nothing wrong with a light Speed Rope either! Athletes and martial artists have long known the humble jump rope was the secret key to a great leg-toning cardio workout. Jumping rope has the added benefit of boosting your footwork and agility. Plyometric training is strength training that consists of quick, explosive movements. These are great for building your speed and power! Plyometric box jumps seem simple, but they’re one of the best plyo exercises you can do (and if you’ve tried them, you know they give you a great workout)! Like freestanding bags, Plyo Boxes are easy to move and relocate for storage. A home gym is still a home, after all – you may not want your workout gear sitting in the living room (or maybe you like that arrangement; that’s cool too). 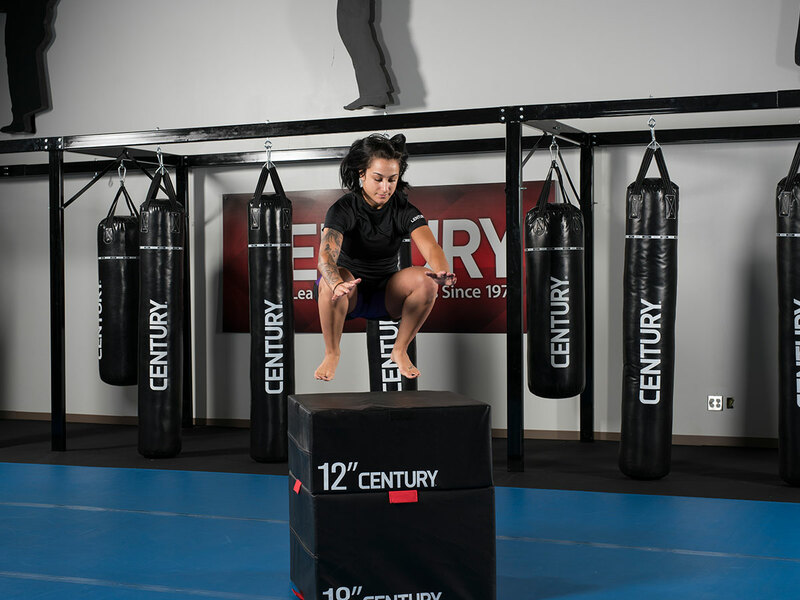 Century’s Plyo Boxes are made from thick, sturdy foam with a vinyl covering. This way they won’t bang up your shins if you miss a jump, and the landing is a little softer on your joints. The boxes are also designed to be stackable. Once you’re comfortable increasing the height of your jumps, it’s easy to do so! What Century equipment you use in your at-home workouts? Share your popular gear picks in the comments.